The 29th Imperial General Headquarters and Government Liaison Conference (Agenda: Negotiations between Japan and the Netherlands). (Offered by the National Institute for Defense Studies, Defense Agency) On Wednesday, June 11 1941, The 29th Imperial General Headquarters and Government Liaison Conference is held. Facing an American export ban, Japan maneuvered to secure the resource-rich Dutch East Indies but was unsuccessful. Japan then decided to withdraw its personnel from the Dutch East Indies. On June 11, 1941 the 29th Liaison Meeting of the Imperial General Headquarters and Government was convened and it was decided that the Japanese representative to the Dutch East Indies should be recalled. The Japanese government, having been subject to the US embargo on important materials, found it necessary to ensure its supply of resources from the Dutch East Indies and entered into negotiations with the Dutch government and the authorities in the Dutch East Indies. However, maintaining the supply of resources sought by Japan proved difficult and it was at this Liaison Meeting that it was decided to discontinue talks and withdraw the Japanese representative. Document 1 is the minutes of these proceedings. 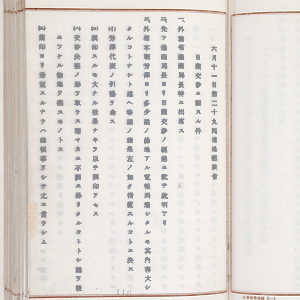 According to this document, on the morning of that day, despite having received a telegram from representative Kenkichi Yoshizawa indicating that there was still room for negotiation, the meeting was convened at the orders of Foreign Minister Matsuoka, Yoshizawa was ordered to return to Japan and nothing whatsoever was signed with the Netherlands although it was not a breakdown of negotiations, rather it was decided that the talks were to be brought to a close peacefully, leaving room for further dialogue. Initially Foreign Minister Matsuoka was intending to sign a memorandum of mutual understanding but at the insistence of the military authorities, who displayed antipathy towards the government of the Dutch East Indies, the opportunity to sign was allowed to slip past.